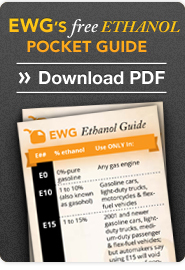 EWG's handy wallet-sized card lists various ethanol blends and which vehicles/engines can safely use them. Click here to print. If you are interested in the dangers of higher ethanol blends to your health and your engine's performance, read EWG's report about transportation fuel that is 15 percent ethanol, known as E15. Since ethanol is more corrosive than gasoline, two studies by the National Renewable Energy Laboratory have found that E15 may cause valves to crack, certain air emissions to increase, engine temperatures to rise and fuel efficiency to fall.